Unrelated to the diet series, I have come down with strep throat and am discontinuing the diet series until I my anti-biotics can remove the razors from my throat. Everything was on schedule and working as planned, however, my sickness has caused me to change my eating patterns to very little food consumption. I should be back on track shortly, and will continue pickup the series where I left off. Apparently eating nothing also causes you to loose and maintain a stable weight. Thank you to all who have been following me thus far, please sign up or subscribe to my feed for future updates from my blog. Looks kind of like the gates of hell in my opinion, except a bit colder. 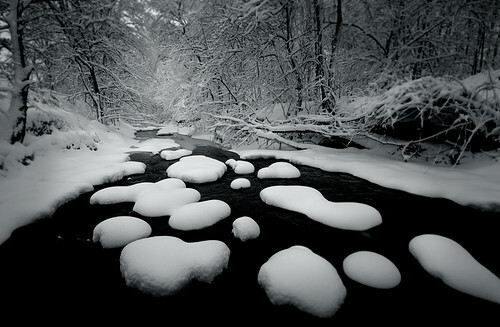 New Snow, Taylor Creek, originally uploaded by peter bowers. Posted on February 13, 2008 Categories RelevanceLeave a comment on Added myself to technorati! Posted on February 1, 2008 Categories RelevanceTags artists tools, clearspring, distribution, distribution platform, myspace, myspace page, play list, playlist, sharemyspaceplaylist, sharing tool, sharing tools, Tools6 Comments on Share Any Myspace Artist playlist! Ive been working on a Myspace experiment for the past couple of weeks to see how many friends I can accumulate. I’m up to about 860 friends so far, you can check it out here: www.myspace.com/virality Ive found its a good way to promote different services such as your music or product, but many of the people that you get as your friend through these types of serves are nothing more than whore bots that will eventually just spam your profile with: “Know who is viewing your profile” or “Increase your man toy”! Wtf I already get that in my email everyday! I guess you get what you ask for..
Posted on January 25, 2008 Categories myspace, RelevanceTags friends, more friends, more myspace friends, myspace, myspace friends, viral sharingLeave a comment on Myspace friends or not..?